When Angela and Scott booked me for an American Basin engagement session, I was super excited for the excuse to visit a new part of Colorado. American Basin is a two hour drive (on a really crappy dirt road) away from Lake City, which again is south of Gunnison. Most people visit the area either for four-wheeling or hiking fourteeners, and it turns out Angela and Scott had visited last summer for hiking. Having a four-wheel drive car is a necessity to reach many of these trails, and so Angela and Scott rented a Jeep for our adventure. I am usually very confident in my own driving, and would trust my Subaru on just about anything, but I had read so many trail reviews saying that you needed extra high clearance for this road. So to make matters easy, I met up with the couple in Lake City, and rode with them to their American Basin engagement session. I love driving to locations with my couples, because it gives us a chance to get to know each other, chat about their lives and relationship, and even knock out some wedding planning on the way. I’m photographing Angela and Scott’s elopement in Crested Butte this October, and it was so nice to go over details in person rather than via emails. Add in some breathtaking views and terrifying drop-offs on the side of the road, and we were in American Basin before we knew it! The mountain ridge at the top of the basin looks like something straight out of the Italian Dolomites! 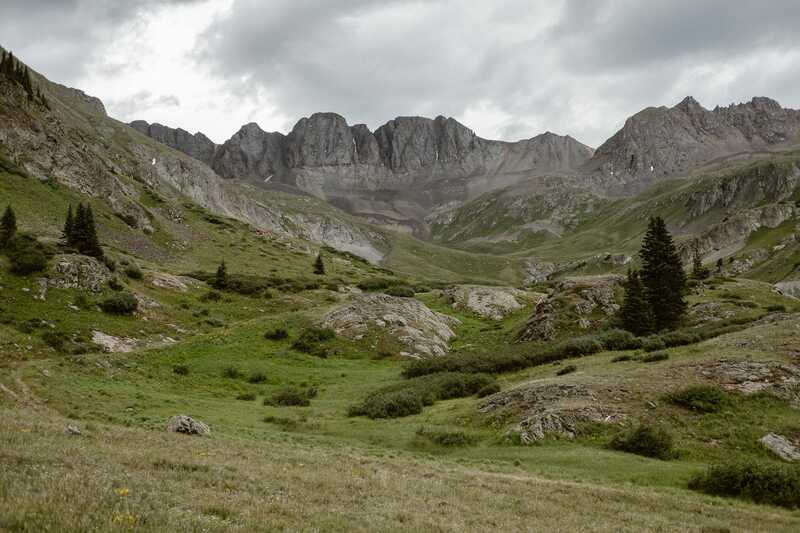 I had of course looked at photos online to prepare for this American Basin engagement session, but photos truly can’t do this place justice. Our timing in mid-July was perfect, because the whole basin was covered in wild flowers! Unfortunately the weather wasn’t quite cooperating with us that day, and it started raining almost immediately after we got out of the Jeep. Lucky for me, Angela and Scott were truly up for an adventure, and so we powered through the rain and hiked around the basin together under the stormy sky. I actually love how the dramatic weather fit with the dramatic mountains, and the rain never got too heavy for us to keep exploring. My favorite little spot that we found was this creek with a mini waterfall, surrounded by rocks and wildflowers! 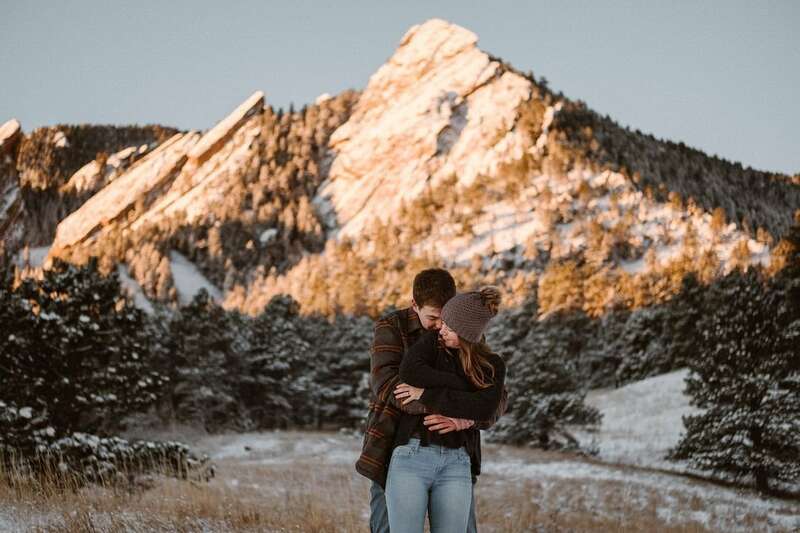 If you’re looking for an epic hiking engagement session, I would love to help you put together something like Angela and Scott’s American Basin engagement! As a Colorado adventure wedding photographer, hiking is my life, and I am always down to explore new locations or share old favorites with new couples. Reach out and let’s create the perfect adventure session for you!